Every year, around the last week in April / first week in May, Galerucella calmariensis and G. pusilla beetles emerge from their underground winter shelters to feed on the young shoots of exotic, invasive Purple loosestrife. 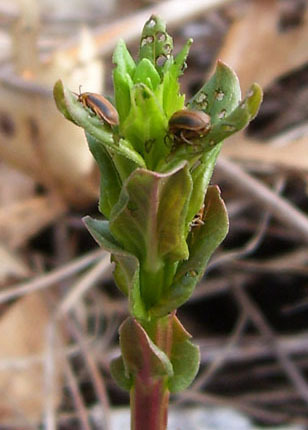 Having emerged from their underground over-wintering shelters, these Purple loosestrife biocontrol beetles feed on the young shoot of an exotic, invasive Purple loosestrife plant. Every spring, since their 2000 introduction to Massachusetts, Galerucella calmariensis and G. pusilla beetles emerge from their underground winter shelters to feed on the young shoots of exotic, invasive Purple loosestrife plants, and soon after, to mate, lay eggs and die. Introduced to the landscape to help control exotic, invasive Purple loosestrife (Lythrum salicaria), which has spread across North American wetlands, outcompeting native plants and making ecosystems unusable by some wildlife, these two species of small beetle eat and only will lay eggs on Purple loosestrife. Their appetites help to control the exotic, invasive plant when native North American organisms can’t do the job well enough. These beetles naturally occur in the homeland of Purple loosestrife – in Europe and Asia. Because the beetles’ life cycles are so specific to Purple loosestrife, they do not degrade populations of native species. Learn more about these beetles. Between 2008 and 2012, the Neponset River Watershed Association partnered with the MA Department of Conservation and Recreation – South Region to release these beetles at several treatment sites in state parklands. We released the beetles in a small wetland swale at Brookwood Farm on the Canton / Milton border, in the Blue Hills Reservation, and also in the northern Fowl Meadow, adjacent to Meadow Rd. in Hyde Park, within the Neponset River Reservation. In addition, we monitored one more study site in the northern Fowl Meadow, on the Milton side of the river. In total, our treatment focused on 25+ acres of Purple loosestrife-infested wetlands. Each year, we monitored plant growth and Galerucella presence at our study sites – in the late-spring, before we had released the beetles, and then once again, in the early fall, after having released the beetles. Our monitoring data revealed the continued presence of the beetles at our study sites, year after year – which is a boon, as it shows that the beetles did indeed develop into a self-sustaining population (our goal). In addition, the monitoring results indicated that the beetles and their larvae continued to stress out the Purple loosestrife plants, causing the plants to focus more energy on restoring themselves than on producing seed (great news for the control of these exotic, invasive plants!). Our hope is that over the years, as Purple loosestrife continues to be predated on by the beetles, a diversity of native wetland plants will grow in greater abundance and sustain a variety of native wildlife, including the endangered species previously recorded within our treatment sites. Learn about the Fowl Meadow Purple Loosestrife Biocontrol Project, and view project pictures. Participate in ongoing study site monitoring. Consider how Purple loosestrife affects pond life, and how soil can be affected by years’ growth of invasive, exotic plants. Learn more about exotic, invasive species. For more information about these Purple loosestrife biocontrol beetles, contact Executive Director, Ian Cooke at 781-575-0354 x305 or cooke@neponset.org. Blue Spots on Milton Mews?